What is the biggest challenge to make children enthusiastic about Subbuteo Table Football? Hermann Kruse: In the first place, most kids really like the game. But only few of them have enough patience to go deeper and learn more. It is not enough to play 15 minutes and perform some nice flicks. What you need is a kid who wants to transfer the turns and tactics from Association Football to Subbuteo Table Football. Some kids suffer from a lack of time after school and they are not able to cultivate another hobby. Or their parents go to work and cannot bring them to the club or pick them up after training. But eventually you did find a group of children with talent and endurance! Kruse: Last year, I introduced Subbuteo at German International School in Sydney on the occasion of a football tournament. Since that day, I regularly practice with six or seven German kids and teach them how to play. Where do you teach them? Kruse: We started to practice at my place but when the group grew more and more, we needed another solution: The German School offered a room for every Friday after classes. Now we are able to train from 3 to 6 in the afternoon and we have enough pitches so that all kids can play at the same time. They have to concentrate for a long period of time and I made up fixed rules: for example, there is no speaking allowed while playing. And no cell phones! That sounds strict, but it helps to focus better on your own game. Subbuteo and unrest – that is not compatible! Practicing Subbuteo: The juniors of the Northern Falcons in action. Footage by Hermann Kruse, originally posted on Facebook. The parents of the kids support your efforts? Kruse: Yes, and they are grateful for activities away from computers and cell phones. Last year, we even participated with the team at the Asia Cup. Actually, I would have flown the 1,000 km to Melbourne with my son alone, but since some of the families had booked their vacations in that area, we were able enter the competition with six players. Your own children also play Subbuteo – and your eldest son is really successful, right? Kruse: My son has a strictly defensive gameplay. Always has seven figures on his own shooting line and only attacks with three. He masters the longflicks well. Can therefore counter attack with long balls when the opponent has opened his defense. He won 3-2 against Singapore’s Vikas Chandiramani last time while I lost to Vikas five games in a row. At the last WASPA tournament, which was also attended by good players from Melbourne, he reached the final and narrowly lost to Luke Radziminski, who is certainly in the Top 10 in the Australian ranking. Falcons youth and trainer Hermann. Photo by Hermann Kruse, originally posted on Facebook. Do you organize your own tournaments? Kruse: We recently held another WASPA tournament with ten people, six adults and four juniors. At my home. I like to cook and always feed my guests. We ate a good old German pea soup, before the inauguration of my new table I organized the “Wiener Schnitzel Cup” and last year we had the “German Bratwurst Cup”. We always have a lot of fun here because not only is Subbuteo played but we also chatted and laughed a lot. And then, there will be Wintermarket at the German School in August. I am organizing an “unofficial” country game between Australian Juniors and German Juniors. With national anthems, flags, etc. – that’s going to be cool. With which equipment do you practice and who provides it? Kruse: So far, everything is my private property and commitment: boards, players, goals, balls. Actually, I try to use cheaper equipment. But the kids also want to play with the good bases. And they are of course all football fans and want to have teams with certain jerseys… I try to make that possible, too. In the meantime, we have set up a small refinancing model: The parents pay ten dollars a month and then additional equipment is purchased. For example, a good goalkeeper for every kid or another good pitch for the club’s training room. When I return to Germany in 2019, everything will remain there can still be used. Hermann Kruse, born in 1962, has been living in Sydney, Australia for several years for professional reasons. In 2019, the family will return to Germany. Kruse, who came into contact with Subbuteo for the first time at the age of twelve, is consistently focusing on youth work to make the game fit for the future. His three children between the ages of six and twelve are also Subbuteo fans. Incidentally, the eldest son beats him regularly, as Hermann must admit. How will work with young talents continue once you have left? Kruse: I’m less worried about the adult teams of the Northern Falcons, and that’s sure to continue. But since all players are older than 45 years, you have to worry about more junior work. It is difficult with the Juniors, since not only my children and I go back to Germany, but also a few others of the seven team members leave. My job until mid-2019 is to bring more children to Subbuteo and recruit my successor. Not easy, because the other parents are all working and the long working hours in Australia do not make it easy to find enough time to organize the junior work. But without offspring, Table Soccer has no future. 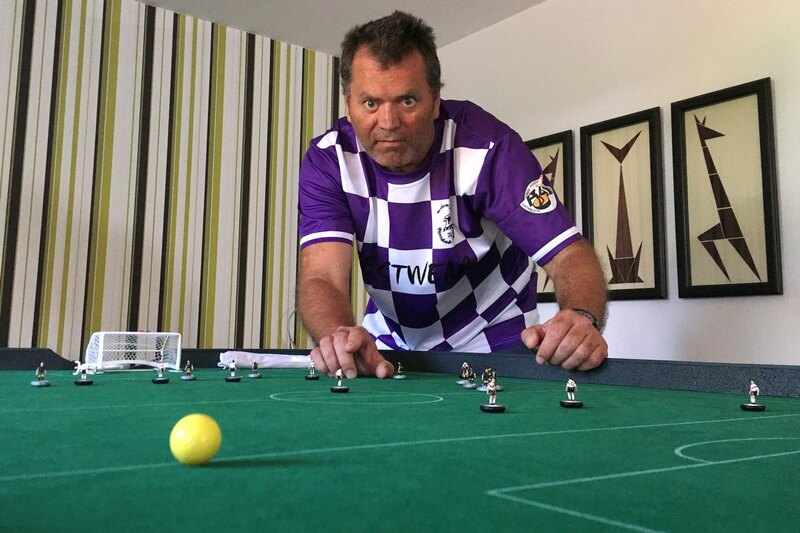 And how will your own Subbuteo story continue in Germany? You’re moving to Berlin, right? Kruse: I will establish my own Subbuteo Club! The Northern Falcons Subbuteo Club Berlin, which will become a kind of Australian branch in Germany, in addition to the two previous Berlin clubs. There I will play with my son and my daughter and try again to find new talents for the wonderful game in schools or church congregations. And we will certainly participate in the corresponding tournaments in Germany. You can make wonderful family trips to the venues, once in a while. You’re interested in Subbuteo Table Football exercises? Get Flicking Forever’s training plan for free (PDF to print)! When I was a kid Hermann and I played a lot against each other in competitions in Germany. It is amazing to see what this hobby means to some people for their whole life!